Mayan Name: AAJ / Ben. Compatibility: Reed, Earth, Crocodile, Serpent, Water. 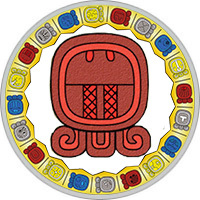 In the Mayan calendar, the sign of Reed (Ben) is an escape, a sprout, development. The meaning of the sign is maize, the patron is the young God of maize. One of the main symbols of the day is the "staff post" - the attribute of the power of the leader. Growing maize can be associated with the image of the World Tree. In the ancient myths of Maya, the World Tree is the center of the universe, the source of inner strength. The destiny of man depends in many respects on the strength of his spirit, the sign of Reed symbolizes purposefulness, development. According to the Mayan horoscope, the people of the Reed sign tend to implement their plans by any available means. Above all, they value freedom and their desires. If there are unforeseen obstacles on the way, they will not even stop to think. The main thing in life is the goal, which roads lead to it is not very important. One can not doubt that they will come up with a new original solution to the problem. The people of this day are revolutionaries, pioneers. They can quite manage with small means, they are very unpretentious in their daily life, but they will not tolerate the monotony of gray everyday life. They love to travel, they enjoy immensely, discovering new places for themselves. According to the horoscope of Maya, the people of the Reed sign are careerists: there is no more fascinating business in the whole world than a favorite work. Fearlessly solve the most difficult issues, until the last stand up for their point of view. They possess the gift of persuasion and excellent business acumen. Because of excessive confidence in their abilities can be in a difficult situation, but they always find the opportunity to get out of it. Choose areas of activity in which they can fully demonstrate their qualities: diligence, dedication, and observation. Among the people of the Reed sign are many famous politicians, lawyers, scientists. For the sake of a successful career, they are ready to sacrifice personal happiness, but more often than not they manage to find a worthy companion of life that shares their interests. In the Mayan calendar, the sign of Reed is a happy day, giving success and prosperity. Usually his representative is lucky in love, spends his life surrounded by the second half and children. In a romantic relationship, she shows softness and suppleness, but demands full return, she wants to be the only and unique — the master of the heart and doom. The partner should not relax, the most important thing in alliance with the man of the Reed sign is every second attention and many surprises. It is only a little bored or get carried away with a new promising idea, the family can forget about it for a long time. According to the horoscope of Maya, the man of the Reed sign will certainly achieve his goal, even if it seems unworkable: a leading position, the heart of an unassailable beauty. For him, there are no obstacles and obstacles, often too reckless, but his courage, determination — qualities that cause admiration. The man of this sign is not constant, he wants to live for his own pleasure. You can not rely on him, he often sacrifices the interests of close people, first of all he thinks about his own comfort. But it’s not boring with him, he tries to paint life with bright emotions. A charming woman of the Reed sign has a strong will, builds bold plans. In her dreams she is a fatal lady, a successful business lady, a loving mother, a faithful wife. And talent embodies her ideas about the ideal life in reality. Her energy is enough for a lot of things, but most of all she likes to travel. She prefers work related to travel. By horoscope of compatibility, she is approached by a calm, reliable man, ready for a serious relationship. For the sake of the chosen one, she will be able to give up a successful career and devote himself entirely to the family and children.